Blog is a great medium to share your personal opinion with large number of people over internet. On top of it you can earn money by blog. How To Start A Blog And Make Money ? Now this question must be coming into your mind. Don’t worry. I am here to guide you and answer this question. You don’t have to be some technical expert to create a blog. It is very simple and you will learn it in a breeze after reading this article. When I started blogging, I hardly had any knowledge as how to start a blog. Searched internet and used it’s resources to create my blog. I have compiled all my experience & knowledge in creating an easy step-by-step guide to start your blog. All you need is a focused attention while reading the guide. Just grab a cup of coffee or tea. Let us now start with the process. Make Money : You can make money by blogging. Sit at home and earn money. Or carry your existing profession, blogging will generate additional income. Blogging is low cost high return work. But it requires hard word. Share Your Thoughts : By writing you can express your opinion, story and information to wide range of people. Blogging is a great medium for this. Promotion : Means to promote your business or product. A blog is a great means to gain more customer base. Be an Expert Writer : Blogging sharpens your writing skills. Thus making it easy to sell your books online as people already know you. Now must have got one of the reasons why I want to join the blogging world. Blogging is way of expressing you opinions and information. To start a blog you need to have a topic in mind. The topic for blogging should be one of the following. A topic should be one that interests you. Something that you would love to discuss again & again. It could be fashion? travel? health? Then only you can shine in the world of blogging. Your profession can be the topic. Writing about your professional experiences can guide & motivate other people in this profession. Life experiences in general can also be your blog topic. Anything from sad to happy moments in life. How you overcame a disease?, how it feels after giving birth? etc. You can pick clear niche in one area. A niche is a one focused area under a large area. Suppose you want to make a blog related to kitchen. You can pick one particular area in this kitchen topic that is called niche. Say you picked coffeemaker? or mugs? or glasses?. This way you will stamp your authority. One thing is sure whatever topic you have chosen there must be many other’s already writing on that topic. Your personal perspective on this topic will make your blog unique from others. And this uniqueness will attract lot of blog visitors. It will act as a dictionary on one area. What To Do In Case You Are Still Confused Regarding The Topic For Blogging? Topic is finalized. You know what you will write about. Now you need to select a blogging platform for start your blog. Searching on internet will throw open lot of blogging platform options. Some of them are WordPress, Blogger, Ghost, Wix, Weebly, Drupal, Tumblr, Squarespace. Among all these, WordPress is our choice. It is a great platform for blogging and is widely used blogging platform throughout the world. WordPress is used by 75 million websites around the world. It has 59.9% CMS market share. 52% of top 100 blogging websites use WordPress. This clearly shows who is the boss. What makes WordPress so popular? WordPress is FREE open source software. Easy to customize, modify and install. You don’t have to be code specialist to use this platform. There is a huge collection of freely available themes & plugins. You can add plenty of functions to your blog by using plugins. Customize the look of your blog by installing themes. Change layouts and much more. The blog/website made on this platform can be managed easily. You can update, create backups etc with single clicks. A WordPress blog is highly secure and safe in today’s internet world. By now you must have decided that you should use WordPress platform for creating your blog. WordPress.org – You use it’s free resources to create a awesome self hosted blog. Having .org at the end of ‘WordPress.org’ does not mean that can’t have .com or other extension at the end of your domain name. You can have any extensions you like after your domain name. My blog which you are seeing right now is made on this WordPress.org. Why I am Advising You To Never Create A Blog On Free Hosting Platforms ? Whatever work you publish at these free platforms belong to these hosting services. Your account can be suspended on any violation of rules. Monetizing a blog at these free platforms is very hard. As you are not allowed to use ads and affiliate programs. Limited customizing options in terms of plugins and themes available at free blogging platforms. Hence your blog will not look impressive for blog viewers and companies want to advertise on your blog. Storage space & bandwidth is another limitation at free blogging platforms. Customized plugins cannot be added in free platforms. When your blogs grows you cannot add new functionality. Make a blog on a free platform only if you are not serious for blogging. My step-step guide will give you lessons as how to start a WordPress blog on paid web hosting. To start a self hosted WordPress you need both web hosting service & domain name. A web hosting is a service which stores all your blog content (files,images, videos etc) and makes your blog visible to everyone on internet. Domain name is your blog address which a visitor types in his browser to open your blog. No web hosting & domain name means no blog. A typical web hosting service charges are $8 per month onward. Cost of buying a domain name is $10-$15 per year. Domain name is bought from the web hosting service. There are lot of hosting companies in the market. One name that standout from all hosting choices and I highly recommend Bluehost. It provides reliable cheap hosting for WordPress. Hosting costs just $3.95 per month. On top of it you get a FREE domain name for first year. Number 1 recommended hosting company by WordPress.org. It is very easy to set up a WordPress blog on Bluehost. These following reasons will make you agree as why you should host a WordPress blog on Bluehost. 24X7 Technical support of Bluehost is excellent. Ready to help you for all your queries. You get a free SSL Certificate. This make your website secure from threats and attacks. The best part is a self hosted professional blog by using Bluehost. Monetizing becomes easy. Bluehost offers 30 day money back guarantee. Incase you are not happy with service or change your mind. By now you must have made your mind to start your blog on Bluehost. Follow below my steps for learning how to start a WordPress blog on Bluehost. After signing up for Bluehost, if you still have any doubts regarding choosing a plan, how to set up, selecting a pricing plan etc. Feel free to email me for any queries. I am here to help you out. On Clicking Bluehost , It will open a new window. Click the green “Get Started Now” button. Clicking “Get Started Now ” will take you to the plan selection page. There are 3 plan options – Basic, Plus and Prime. All three plans have a FREE domain. I recommend you should use the basic plan to start WordPress blog. It hosts single website. This plan is the cheapest plan. You pay $3.95 per month if you buy the hosting for 36 months. When in future you want to launch more WordPress websites you can upgrade to plus plan/prime plan. This gives you the option of unlimited website hosting. Bluehost is simply amazing because of this unlimited factor. On clicking green button “select” under the plan, it will take you to the Domain Registration Page. This is where you get your FREE domain. Domain is the name which people will type in the browser and visit your blog. Now you will we wondering what name shall I select. What name extension should one select. Shall I select .com , .net, .org or anything else. I recommend you should select .com extension as first choice. As this is the most popular used extension. In case if you already have a domain type type it on the right. Or else type the name on the left and press next. If the name is available you will move to next account set up page. If your desired name is not available Bluehost will show you a list of available names similar to your typed name. This process is little frustrating as simple names you think might already have been taken. The easy way to find the name is by thinking of the topic for which you are making the blog. Example if you want to make a blog on Fashion. You can use Latestfashion.com, Hifashion.com, TopFashion.com, Fashionquest.com. Try adding or removing a letter to the word. For word Trend you can add “z” , ” Y”, “s” . You get a new word Trendz, Trendy, Trends or anything creative you like. What To Do In Case You Are Still Undecided On Domain Name Selection? At this page you fill personal details and billing information for account set up. Scrolling down to package information. Select the account plan. This is choosing hosting duration. You are billed as per the year- 1,2,3 & 5 years. You are paying upfront. The cheapest plan is for 36 months. We recommend that you select 36 month account plan. As this plan offers best value for the money. A saving of $142.44. Super deal. Going down package extras are optional. It is your decision whether you want to purchase or not. We generally do not recommend to purchase them now. As you can buy later if you think you need them. Fill billing information, agree service terms and click submit to complete. Clicking submit will open a new page showing special offers & upgrades for you. Skip them by clicking “no thanks” link. This page show your purchase was successful. You will receive various welcome mails from Bluehost regarding your created account. It will ask you to create secure password. Click “create password” green button. It will take you to new window. Create a new strong password in this window. Clicking “Skip this step” link in free themes page will open a new page. You have two options either to build your WordPress website by clicking “Start Building” blue button or “go to my Bluehost account”. At present your blog will be on temporary domain. New domains take 1 hour to a maximum 1 day for getting registered. When done, Bluehost will shift your blog automatically to registered domain. No point going to Bluehost account now. Let’s complete WordPress installation. 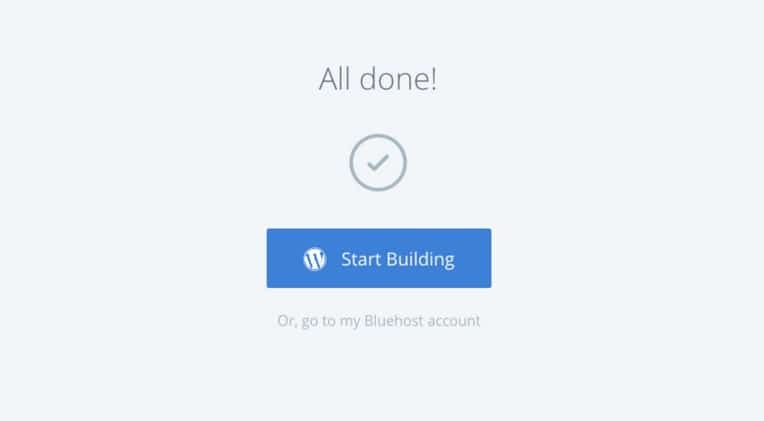 Login to WordPress dashboard click “Start Building” blue button. This is how a dashboard looks. Left hand side is the menu of WordPress dashboard. In the center you have Welcome to WordPress” message. Here Bluehost will ask you to help setting your blog. Click “I don’t need help” as you can do more easily by using the menu on the left hand side. At present your blog homepage that is www.yourblog.com will show coming soon . The first step to make your blog go online. Click Bluehost>>Home on the left hand side. Click “Launch” blue button in the center where it is written Launch your site. Clicking this button will open a new pop up. Over here you need to fill your blog name and blog description. Now whoever visits your site URL, they will see your site name and description. It the the first step in making your blog going online. Installing WordPress is complete. Now let’s beautify & add functionality to your blog. There are lot of WordPress themes available. Paid as well as free ones. Since you have just joined the blogging world, you should experiment with free themes first. In the WordPress dashboard. Click Appearance on left hand side . Then click Themes. Click Add new button on top. You will move to next screen. It will show you amazing list of freely available themes from WordPress.org themes directory. The themes can be sorted on the basis of featured, popular, latest, favorites and featured filter. Using Featured Filter guides you in blog theme selection as per your topic, features & layout. This will sort themes based on your requirement. You will be confused to see so many themes. As there are 6200 freely available themes. Which theme I should select. My advice to you is to go for a clean & crisp looking theme. A clean theme ensures good visual presentation to your blog visitor. In case your are not satisfied with themes. You can install your own chosen theme. To install your chosen theme you need to click Upload Theme button next to the caption Add Themes. The theme is downloaded on your WordPress website but is not yet activated. In the next page click Activate link to activate the theme. Bingo you have installed your chosen theme. 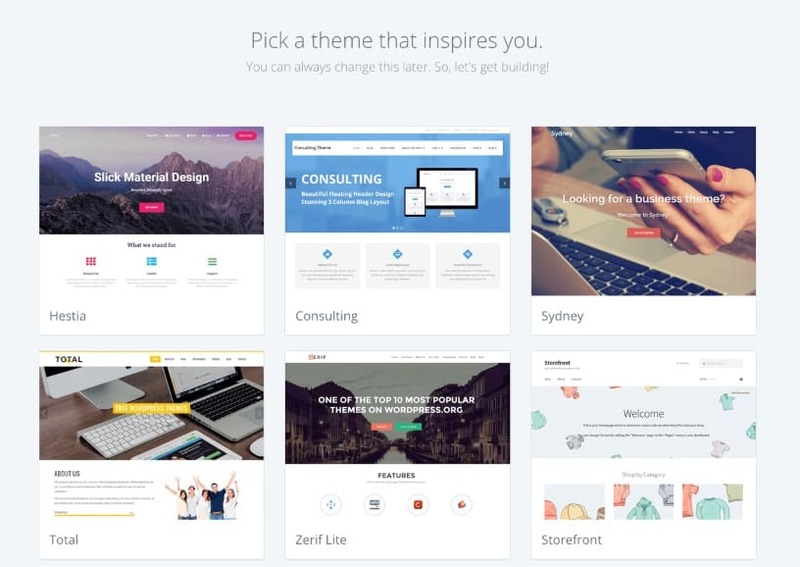 Free Themes Vs Premium Themes – Which One To Choose ? Free themes are best way for someone one who is entering the blogging world. But these themes don’t have the customization and tools that premium themes offer you. If you are willing to spend $50-$100 then you should go for premium themes. Premium themes have powerful tools which makes your website look professional, clean and sleek . Other important considerations for premium themes is that they offer you dedicated support staff to make you successful in the blogging world. Quality in the world of blogging goes miles. Now the question comes where should I buy and which ones should I buy? 1. StudioPress Themes : They offer you themes based on Genesis framework. If you have gone through internet you would have seen 90% propagating to use Genesis framework. It makes your blog will look professional. WordPress is amazingly fast and efficient. First you need to install a Genesis Framework and then a Child theme. StudioPress are original creators of genesis frameworks. This is a genuine place for buying these themes. The best part of buying themes from StudioPress is that you can use on unlimited websites and get unlimited free future updates. Buying Genesis framework from other place is a dangerous thing as it may contain malicious code, which can destroy your website. This blog is you are seeing right now is based on Genesis framework and I am using Mai Lifestyle Pro theme. Both bought from Studiopress. My 2 websites are using this theme. To customize these theme you should have a coding knowledge or you will need to buy Design Palette Pro in case you have no knowledge of coding. It makes customization super easy. There are over 20+ child themes available at StudioPress. You can check my list of best genesis child themes. 2. Divi Theme : A great theme that offers you plenty of customization from elegant themes. This makes your website super cool with so many options. Second choice after StudioPress. 3. Avada Theme : This is no 1 downloaded theme at themeforest.net. Over 4.40 lakhs customers have purchased this theme. It offers amazing customization options. One of my website is running on this theme. If you want amazing professional quality go for StudioPress themes. Themes based on Genesis framework are the best ones. Hope you have found and installed your theme. You are ready for the next step. Click Users>>Add New on the left side vertical menu. It will open a new user page. Fill details in this page. In username write the name you want to to use to login into WordPress. Email is basically added in case you forget your password. New details are mailed to your email. To fill password click “show password” next to Password. Add the password you desire. The last most important thing . Select administrator from the drop down box next to Role. Fill username and password. Ticking remember me is optional. If you tick mark this, you won’t have to fill your username and password again for few days. It will allow direct access to WordPress admin panel. This is how you enter WordPress website dashboard. A master panel is a place to customize your blogs and write your posts. Before writing your first post let’s add more functionality to the blog by adding plugins. WordPress plugins are like apps of smartphone. It adds additional function or extends existing functions to our blogs. There are 55000+ free plugins available at WordPress directory. There is a plugin for any task you want to complete in your website. This makes self hosted WordPress blogs look so amazing. Tremendous customization. These software bits by facilitating various tasks & adding new features makes our blog more visitor /admin friendly. Thus making money from blogs becomes easy. You must be wondering what type of plugins I should install and how should I install. Let us first discuss how to install WordPress plugins. Click Plugins>>Add New on the left hand side bar. WordPress.org shows various plugins in your dashboard window. Plugins are sorted on the basis of clickable horizontal menu at top- Featured, Popular, Recommended & Favorites. Featured shows a plugins as highlighted by WordPress.org. Popular shows you a list of highly installed plugins. Clicking Recommended shows you plugins based on your already installed plugins. Favorites shows a list of your marked favorite plugins. You can search the plugins by typing it’s name, author or tag in the search bar. Then press enter. The plugins are displayed. Each displayed plugin has clickable link – Install now & More Details. Clicking More Details shows plugin description. On clicking Install Now the plugin gets installed in your blog. Install Now button changes to Activate. Only on clicking Activate the plugin starts functioning on your blog. You have learn’t how to install plugins. Now you will be wondering what plugins I should install since you are a beginner. 1. Yoast SEO Plugin : This plugin optimizes your blog for search engine traffic. Your articles are searched by keywords and phrases. If you follow SEO principles in your blog it will lead to good amount of traffic. High traffic to to your blog is a billion dollar. Installing Yoast SEO plugin will optimize your blog. It makes SEO look so simple. Just install & activate the way I have told you. Click SEO>>General on left hand side menu of your wordpress dashboard. Click Open Configuration Wizard Again. Now set up by visiting this Yoast SEO Configuration Wizard link. After you have completed setup, you need to visit Yoast SEO User Guide to learn how to use it. 6. Imagify :This plugin will reduce the uploaded images size. Thus making your blog light and leading to increased website speed. Google analytics is a very important tool to track site traffic. It gives you various information regarding the blog traffic- Number of page views, traffic from mobile or desktop, traffic from various sources and much more. To set up first you need to create the account at google analytics . When you are done you need to insert the code in your blog. You can insert the code in your themes header.php file or use insert headers & footers plugin. The plugin is easiest way in case you have no knowledge of coding. Once done you can check various blog traffic stats from google analytics. This step will add lot of excitement. You will create your first blog post. To create post you click Posts>>Add New at left side bar. It opens text editor for you to write your post. Like any editor it has text editing and formatting tools. Text color change, insert links, alignment, underline, bold etc. You can add photos & videos by clicking add media button. You upload image/video and insert in the post. The top bar under add new post is to write the title of the post. On the right side you can categorize your post by adding categories. Add tags that enables great searching in your blog. Add featured image to show on homepage and category listing. After you have finished writing. You click Publish button on the right hand side to publish your new post. This posts goes for indexing in search engine. Created first post is now seen in your blog homepage. It is a joyful experience seeing it. Now you have learn’t how to start a blog in WordPress. Welcome to the world of blogging. 1. Make Useful Blog Posts : Blog visitors are looking for useful content. You should always make content that people love reading and which enhances their life. A helpful post answers reader queries. A resourceful post is bookmarked and bring repeat traffic. 2. Create Compelling Headlines & Titles : Your posts are read if your blog post title provides thought provoking information. Readers will click such articles with headlines that are answering their questions. 3. Blog Post Length : Short posts containing 300 words. They never give detailed information. In depth posts are long posts. Long posts contain 2000 words. They deliver your resourceful information in detail to the reader. Long posts are not only loved by readers but such posts are darling of search engine. Such posts bring consistent search engine traffic month after month. 4. Add Catchy Images : Post images make you post look impressive and at the same time bring lot of social traffic. Get free online stock images. And use free online editors like Canva and Pixlr to make catchy images. 5. Personalize Blog Content : Write posts from your point of view. Share your personal experiences as this connects well with the reader. This will make post unique. Site pages are handful information pages. They tell your website visitor what your website is all about, how they can contact you. Before you start publishing articles on regular basis you should add these essential pages. It is one of the most visited pages. This page tells the site visitor what the website is all about. How is it useful to him. People love to know the person behind the website. Make it interesting & helpful. This page is necessary when you are promoting affiliate products or using ad networks to make money from blog. These are basically standard polices as required by the law. After posts are created. You need visitors to see your blog content. Traffic to your website is the lifeline. There are various ways to promote your blog. Some of the prominent ways are listed below. Facebook : Create page & group dedicated to your blog. Join groups which are similar to your blog niche. Regularly adding your post will bring traffic to your blog. Pinterest : This is a another great way to generate great traffic to your blog. Pins created will generate lot of free traffic regularly. The art is to create high quality pins to generate blog visitors. Instagram : Posting content on this social media will generate lot of followers. GOOGLE : Google is the king of search traffic. Having your blog post at top of search engine page will generate lot of organic traffic. You need to learn SEO for high post ranking. How can you earn money from your blog ? This is the question that must be coming in your mind. 1. Direct Display Advertisement : There are many advertisement networks you can use on your blog. One of the most popular networks is Google Adsense. 3. Sponsored Posts : Companies hire you. You get paid for writing a review on their product/service on blog. 4. Sell You Own Products : This is the ultimate earning opportunity. The whole world is your customer. You can sell your digital products, other products or services at your website.